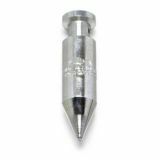 Here at Drainage Superstore we have a range of plumb bobs for a range of applications and projects. What is a plumb bob? Plumb bobs are one of the most simple tools in construction and have been used for hundreds of years, dating back to Ancient Egypt. A weight with a pointed tip at the bottom is suspended from a string, and used as a vertical reference line, to ensure that a line is completely vertical, or plumb. Plumb bobs are most commonly used to ensure a construction, or object, is completely vertical. This can be in carpentry, masonry, or during bridge building, and even astronomy. Plumb bobs can be used to build walls, ensuring they are truly vertical from ceiling to floor, or even for hanging wall paper – once there is a vertical reference line it can make hanging wall paper much more simple. Click the links below to order 4oz, 8oz or 1lb plumb bombs, designed in durable steel.